The McDonnell Douglas Helicopter Systems MD 500 Defender is a light multi-role military helicopter based on the MD 500 light utility helicopter. The original OH-6 Cayuse helicopter proved its worth during the Vietnam War in the light helicopter role. The designers at Hughes realized there was a market for a light multi-mission helicopter with an improved equipment fit than the OH-6 and Model 500M. The resulting design was the Model 500MD Defender which first flew in 1976. It was tailored for specific roles including unarmed observation and an armed scout helicopter equipped with TOW anti-tank missiles. An anti-submarine version was developed with a search radar, magnetic anomaly detector and the capability to carry lightweight aerial torpedoes. 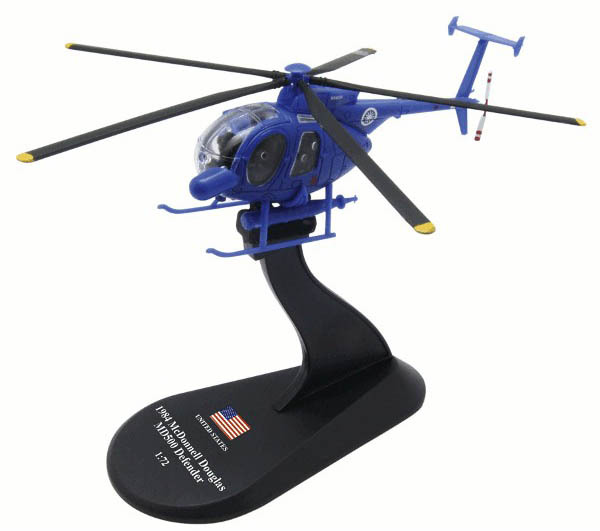 The helicopter was popular with customers like Kenya who could buy a capable anti-armor helicopter for less than half the cost of a gunship such as the AH-1 Cobra or the AH-64 Apache. Israel used the Defender extensively during the conflicts of the late 1970s and 1980s against Syrian armored forces. The Defender was later built as an improved version as the MD530MG, with increased engine power, handling, avionics, and a redesigned forward fuselage. Later developments included a mast mounted sight (MMS).